first thing I want to share with you is our Minties Narratives, now for all those folks who are not familiar with Minties, they are a spearmint flavoured chewy candy,I love them! Each week my Principal leaves some kind of yummy treat in the staffroom, a couple of weeks ago she left us some Minties, yum. Anyway as I was looking at the wrapper I was struck with inspiration! On each wrapper there is a little pic with the tagline of "It's moments like these you need Minties!" Well, of course you do! So I gathered up the wrappers, thanked the Principal and asked the rest of the staff to please pass on any wrappers to me. My kiddos then got to choose which wrapper they wanted to use for a narrative using the picture as their problem. They then had to plan their narrative, this took a few steps because my kiddos really need a lot of visual help to plan. So they filled in a filmstrip to show the steps. They are still in the process of completing their final draft and setting it out as a book! This actually took longer than I thought it would but I am glad that they took their time with it and have seemed to really enjoy it. Will share pics of some of the finished products in the next couple of days. We have also been looking at angles in Maths this week and to help my kiddos remember we made posters of the acute, obtuse and right angles. 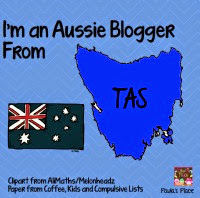 I saw this idea on another blog a while back and I have a feeling it was one of my fellow Aussie bloggers but can't remember, please let me know if it was you. So here are a couple of pics of their posters, I was pretty impressed! I love the skate ramp in this one! This little kiddo included angles as her border! I think the part they liked best was that I let them put their own posters up, heehee. Well, I hope you enjoyed my belated week in review, this week we are working on tesselations and mosaics, also I should have a Christmas freebie ready to go by tomorrow so keep an eye out for that one! Oh my goodness I LOVE your Mintie narratives!!! I'm DEFINITELY borrowing this idea :) I'm going to Pin this fabulous post, too! Thanks Judith, they really did enjoy it! I am actually starting to pack my room up as I will be moving on at the end of this year, so that was one of the walls I had packed up already. I am planning on using it for xmas display so these can go home in the next few days to get ready for xmas. What a great idea with the Minties. I wish I was teaching an older grade because I would love to do that activity. I also gave this to my special needs student who works at a kindergarten level in my yr 2/3 class and I got her to use it as a stimulus to write a sentence. I think you could adapt this to suit almost any year level. My little girl chose the pic of the man with no umbrella out in the rain. Her sentence (signed) was the man forgot his umbrella in the rain. Have a go, you never know what you will get. I like the pictures your kids came up with for their angles. Thanks for the comment Klaire, the great thing about those pictures is that they did that without my instruction, I have a very creative group this year.